Back in September, I did a Hasslefree Jen Speed Paint Challenge. However, I never completed her base. I glued her to a Micro Art Studio pre-cast base and set her on the "I'll get to it soon" shelf. Six months later, I finally got around to it. I struggled with how to paint tentacles (which I later realized these are meant to be vines but oh well. Creative license!) I found little success in my previous attempt to paint them a dark Nightshade Purple with a few spot highlights here and there. 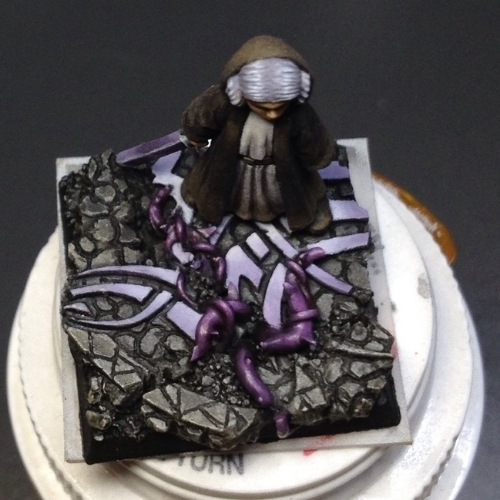 A fellow painted suggested to paint them as skin with more subtle shading and blending. Bingo! I decided on a more saturated red violet to contrast with the lavender purple I'd been using for other parts of the miniature. 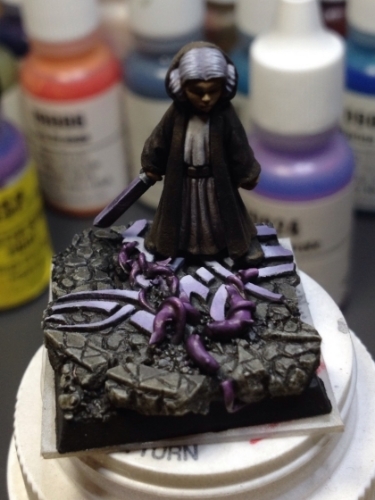 Since the speed paint challenge called for a limited number of colors, miniatures can be reimagined and added to after the challenge & picture sharing is complete. My hope is that her hair appears more grey, while it works well with the "glowing runes" she's standing on. My biggest challenge was to make the tentacle-like vines appear shiny-- difficult to do with matte paint. While I didn't want to resort to paint-on gloss varnish (I don't care for things that are too shiny and distract from the rest of the miniature), I settled for a paint-on sealer than falls in between matte and semi-gloss. Without it, the tentacle-vines appear too chalky and stone-like. After two thin coats, I was happy with the results! 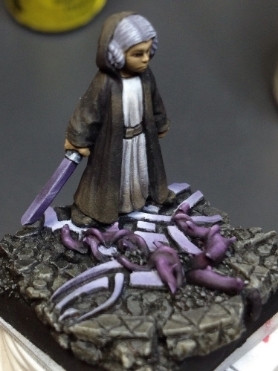 This miniature's meant to be simple in her dusky, unadorned robes and natural facial features. 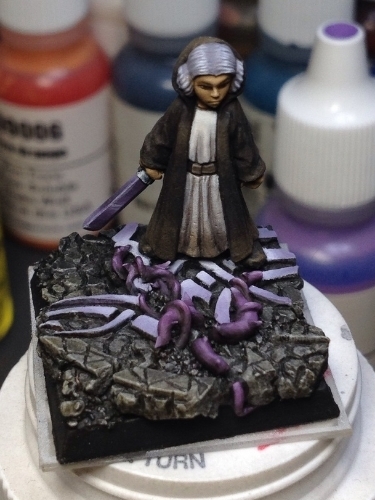 Despite her simplicity, her belt beckons for a bit of freehand detailing. The raised, curved stone at the bottom left edge also has the potential to be an additional area interest. I don't want to get carried away just yet, so for now, I'll call her done as soon as I fix that "glowy rune" section I missed-- can you spot it? Yep, it's driving me crazy too. So close, yet never quite done!